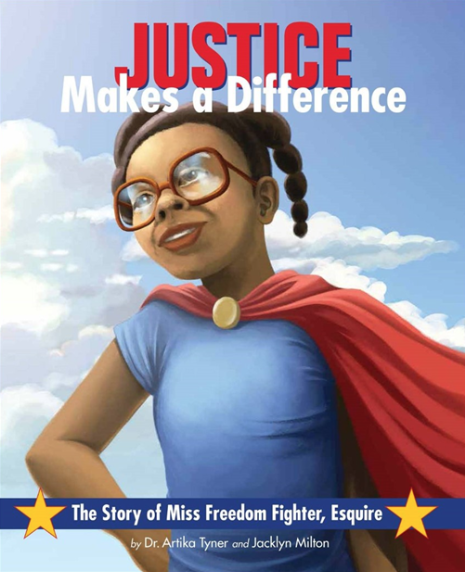 Since its launch in December 2017, Justice Makes a Difference: The Story of Miss Freedom Fighter Esquire is making quite the impact. The first children’s book by authors Dr. Artika Tyner and Jacklyn Milton is inspiring young people to become leaders and change agents around the world and becoming an International Best Seller. The authors made a commitment to donate 1,000 books to children across the globe and as of June 21, they are happy to report 544 copies have been provided. The empowering message of Miss Freedom Fighter Esq. has reached students in the countries of Uganda, Ghana, Nigeria, and Namibia to name a few. Here in the United States, Justice has impacted students in New Orleans, Houston, Boston, Baltimore, Minneapolis/St. Paul, and other cities. And there’s more exciting news: Justice was named a first-place winner in the 2018 Purple Dragonfly Book Awards (in the Charity/Making a Difference category). Additionally, Justice is a best-seller on Amazon, garnering 15 reviews, all 5 stars. Congratulations on this momentous achievement! You can support the educational and literacy programs of the Planting People, Growing Justice organization by ordering a copy of Justice Makes a Difference. All book sale proceeds support the leadership institute.